• Cultural insights in Gangtok -capital of Sikkim and Yuksom. 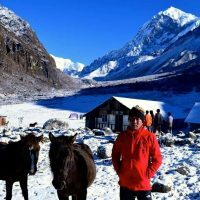 • A beautiful trail offering otherworldly landscapes such as scenic alpine valley, Lakes, Glaciers, Yak herder camp. etc. 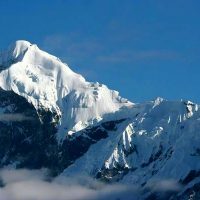 • Astounding view of mountains like Koktang 6,147m, Ratong, Kabru 7,338m, Kangchenjunga 8,586m, Simvo 6,815m and Pandim 6,691m. 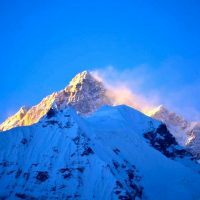 For any trekkers, mountains are their refuge – a home, enticing them with its irresistible mystical allure. 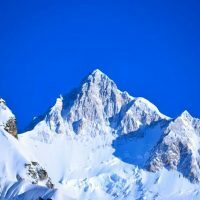 The Himalayas catches this spotlight invariably, and Kanchenjunga – the 3rd highest mountain in the world, takes the whole idea of mystical elements and curiosities to next level. 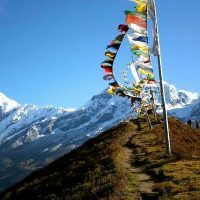 This itinerary brings you to the Sikkim side of Mt Kanchenjunga, up the forested hills and through alpine meadows, to the weather beaten trail, with beautiful lakes, glaciers in the changing clouds at mountain pinnacles. Spring bring forth rhododendron, orchids and magnolia in technicolor bloom – a running riot of colours. The climax is uninterrupted and surreal views of Mt Kanchenjunga at its glorious best and other peaks. Prelude to this is culture visit with short walk in Gangtok, Yuksom for insights into living culture as well as acclimatisation. Upon arrival at Bagdogra/NJP transfer to Gangtok – capital of Sikkim. In the evening you can take a stroll at MG Marg – a pedestrian boulevard and also visit the Lal Bazaar (now Kanchendzonga market). (Altitude 1700m/ Distance 135 kms/ 4-6 hrs drive). Overnight in Gangtok. Full day tour of Gangtok starting with a visit to Enchey monastery from where you can have an excellent view of the mountains. Further visit Directorate of Handicrafts and Handloom, Do-Drul Chorten and the Institute of Tibetology which has an impressive collection of Tibetan artifacts and ancient manuscripts. After lunch drive to the opposite ridge to visit Rumtek Monastery. After the visit return back to Gangtok for overnight. 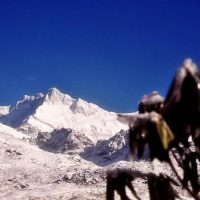 After breakfast, drive to Yuksam in West Sikkim – a trekker hub. 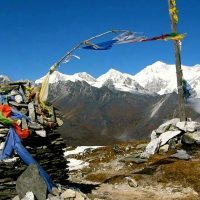 It is also of historical importance as the place where the first Chogyal (king) of Sikkim was crowned in 1642. En-route visit tallest Buddha statue in Ravangla. Upon arrival check into the hotel. Evening we’ll rendezvous with our trekking staff, including the Sherpas, porters, and the cook. Overnight in Yuksom. (Alt. 1780mts/134 kms/5-7 hrs). Note: there are frequently some on going road work, so driving time may change for more than anticipated. Set off early enjoying the breathtaking views of Mt. Kanchenjunga (8,586 m), Kabru (7,000 m), Pandim (6,691 m) and the Rathong glacier along the way. The trial goes through rhododendron forest and pasture lands until Chamaray, from Chamaray a steep climb will land us to Laxmi Pokhari, a big lake in a deep crater. If you feel fit continue up to Kabur rock. Back to Dzogri for overnight. Overnight camping. The trail from Dzongri to Bikhbar ascends and gradually descends till Bikhbari. (About12km/4-5hrs). Overnight camping. Day 8: Excursion to Kanchanjunga base camp. 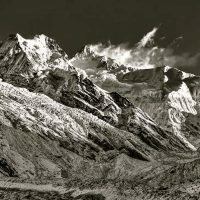 (Chaurikhang and Rathong Glacier). The trek to the Kanchenjunga Base Camp is a gradual ascent all the way. 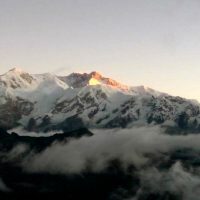 The Khanchenjunga base Camp is awhere the Himalayan Mountaineering Institute of Darjeeling conducts its Advanced Mountaineering Courses. From here, we get close-up views of Frey’s peak(5830 meters), Koktang (6,148 meters), Kabur and Rathong glacier. 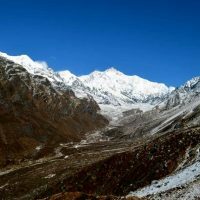 Explore and enjoy the splendid view and descend back to Bikhbari for overnight. Overnight camping. Early morning after breakfast we retrace our step and trek back to Bakhim for overnight stay. After breakfast trek downhill to Yuksom. Visit Dubdi monastery which is situated on the top of a lofty hill one thousand feet above Yuksam. After the visit descend down to Yuksom hop into the waiting vehicle and drive to Pelling for overnight stay. Overnight in a Pelling. After breakfast transfer to the airport/railway station for your journey homewards or to your next destination. Trip AccommodationBest available 3-4 star hotels in Gangtok and Yuksom and state of art camping(tent & other equipments) while trekking. Starting from USD$ 1000 however cost varies based on group size, travel date etc. Please contact us for cost details. 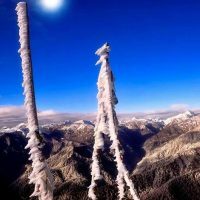 Accommodation in listed hotels during the tour and in camps while trekking. Bottled mineral water in drive.All sight seeing and entrance fees to the monuments. 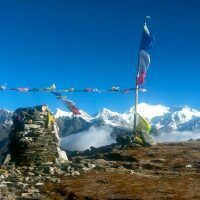 During the trek: All meal and beverages, trekking equipment’s including tents, trek mats, blow pillow, hot water bag, pack animals (horses or Yaks) to carry luggage, basic medical kit and support staffs (guide, cook, assistants and porter/horseman). International and domestic flight cost. Personal Gears (sleeping bag, clothing, shoes etc). Personal expenses such as bar/beverages in the hotels, optional tips/gratuities to staffs, laundry, gifts etc. Dawa Lama hails from queen of hills – Darjeeling. 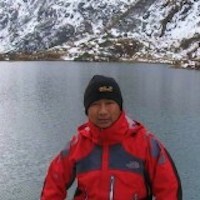 He is well versed in cultural aspects but his love for mountains, wilderness of Trek is more profound. For his love for the trek, he treaded many paths less travelled. He feels at peace and at home in mountains and he believes that being in mountain is being close to his root and to his very existence. To give wings to his passion, he enlisted in mountaineering course in H.M.I. Darjeeling and disaster management course and completed in flying colours after one and half years . Following the tradition, he started as a a cultural guide in 2008, simultaneously, he was pursuing his degree course also and completed in 2004. His early education was in school run by Jesuits father. He grew up watching the sun rises at far horizon of eastern Himalayas from Tiger hill, which still is one of his favorite place. Mountains has its own way to strike bond with individual . For Pasang Wangchu Sherpa, the romance with mountain or Himalayas to be specific started when he was a kid. Growing up in Darjeeling under constant watchful eyes of pious Kanchenjunga and whole gamut of Himalayas ranges, left an indelible imprint that influenced his adolescent. 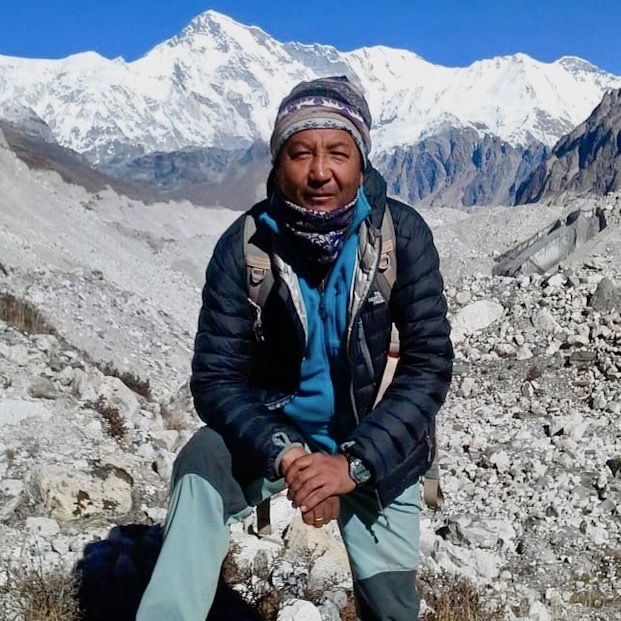 After his graduation in academic from Darjeeling college , he renewed his love affair with mountains. 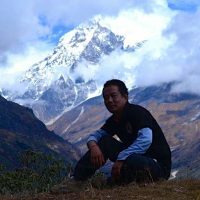 He trekked countless times into various ranges in Himalayas such as Sandakphu Trek, Dzongri and Goechela trek, Kanchenjuga Base camp. In 2004, he was part of successful Mt Everest trek expedition in Nepal. Also he has led tour in Kashmir (India) such as Stok Kangri in Ladakh. Its been over 25 years and counting and his love for mountain has hardly diminishes.